Why hire Link & Smith? If you’ve suffered an injury, you need Georgia personal injury lawyers who will do everything in their power to make sure you are adequately compensated for your trauma. At Link & Smith P.C., we are those lawyers. Our practice prides itself on several key tenants, which include our philosophy, our ethics, our client dedication, and our credentials. All of these factors make Link & Smith P.C. the ideal injury law firm. Our personal injury lawyers are dedicated to helping our clients achieve the case results they deserve, and will stop at nothing to assist them in every legal aspect of their claim. When you are seeking to hire a personal injury lawyer, case history is a clear indicator of the quality of an injury practice. At Link & Smith P.C., we have a history of impressive case results, all of which have left our clients satisfied and adequately compensated. Our case results have resulted in monetary compensation worth upwards of $40 million. Needless to say, our case history is just one of the many reasons why you should hire Link & Smith P.C. At Link & Smith P.C., we pride ourselves on being accessible. This means that when you call our office, you will be speaking directly to an individual and not an automated voice machine. In addition, we always meet with our clients in person, which is something you can’t get with one of the larger injury firms. Contingency Fees at Link & Smith P.C. At Link & Smith P.C., we always work strictly on a contingency basis. This means that we will not be compensated until you are. Thus, you can rest assured that we will treat you as an individual, not simply as a means of profit. We are personally invested in your success as a client, and will handle your claim with dedication and compassion. Many other personal injury law firms handle a variety of legal fields. These include criminal law, family law, estate law, and tax law. At Link & Smith P.C., we believe that, in order to achieve successful case results, an attorney must be focused exclusively on personal injury law. Therefore, our law firm exclusively handles personal injury cases. 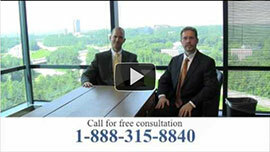 Mark Link and Houston Smith are veteran trial lawyers. They have over 40 years of combined experience in the field of personal injury law, so you know they have the knowledge and expertise needed to help you receive the case results you deserve. Rest assured, that no matter how you have been injured, Link & Smith P.C. is here to help! At Link & Smith P.C., we always offer complimentary consultations for our prospective clients. Additionally, these consultations are offered in-person and at your convenience. If you’ve suffered a personal injury, don’t hesitate to contact our offices. Call Link & Smith P.C. today for your complimentary consultation at 404-315-8840.